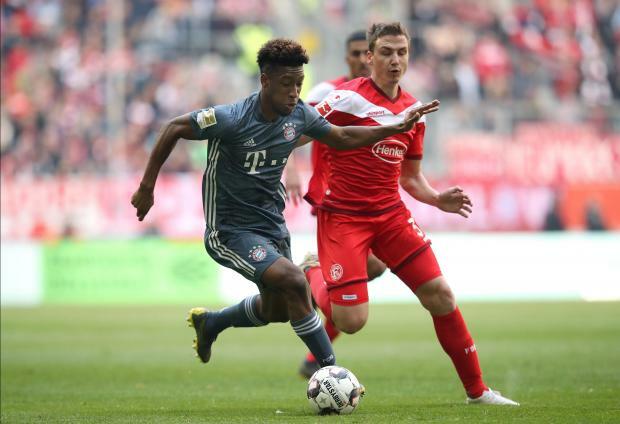 Kingsley Coman played his way out back into favour on Sunday, with a first-half brace that helped fire Bayern Munich back to the top of the Bundesliga with a comfortable 4-1 win at Fortuna Duesseldorf. French winger Coman was involved in a training ground punch-up with Robert Lewandowski earlier in the week, but on Sunday he kept Bayern on course for a seventh successive league title. Bayern, needing three points to stay top after rivals Borussia Dortmund edged to a nervy win over Mainz on Saturday, barely broke a sweat as they cruised to victory on the banks of the Rhine. Coman's first goal was unintentional, his inswinging cross just evading Thomas Mueller on its way into the bottom corner with just 14 minutes on the clock. If the opener was briefly incorrectly credited to Mueller, there was no doubt about Coman's second in the 41st minute, a well-placed finish at the end of a delightful move. Serge Gnabry added a third 10 minutes after the break, turning the ball in at the far post after Mueller had flicked it on at a corner. Dodi Lukebakio gave Duesseldorf a late consolation goal from the penalty spot after a Mats Hummels handball, but Leon Goretzka slotted in Bayern's fourth in injury time. The win keeps Bayern a point ahead of Dortmund with five games still to play. "Dortmund are not playing brilliantly at the moment, but they are getting results, and that puts pressure on us," Mueller told Sky. "Sometimes, a bit of pressure does no harm." There was some bad news for the league leaders, however, as goalkeeper Manuel Neuer was forced off with an injury early in the second half.